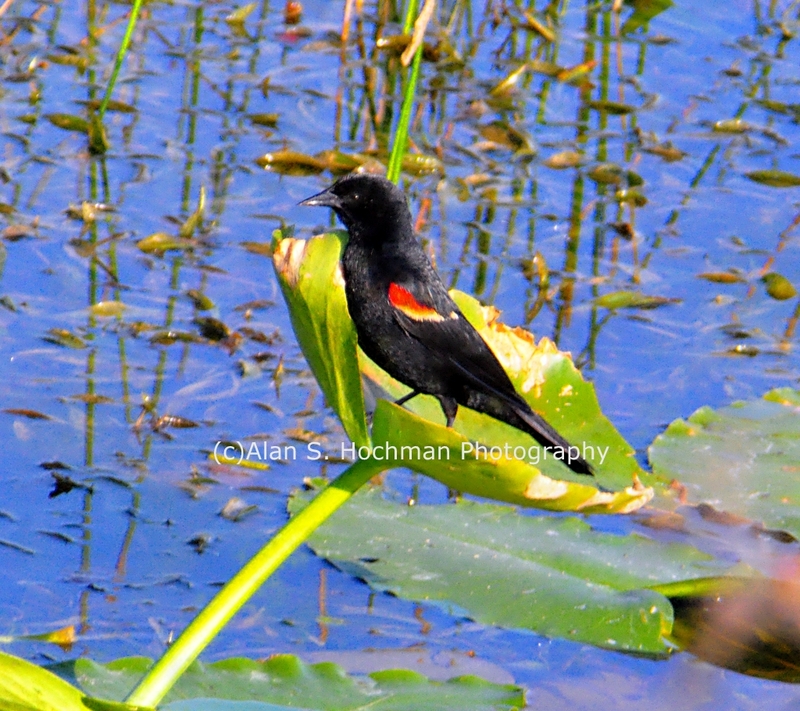 Photographed above is a Red-wing Blackbird captured along the L-28 Levee in Collier County, Florida. This bird was photographed using a Nikon D90 attached to a Tamron 28-300mm lens. One of the most abundant birds across North America, and one of the most boldly colored, the Red-winged Blackbird (Agelaius phoeniceus) is a very familiar sight atop cattails, along soggy roadsides, and on telephone wires. The male Red wing Blackbird is glossy black and have red and yellow shoulder patches, and they can puff up or hide depending on how confident they feel. The females of this species of birds are a subdued, streaky brown, almost like a large, dark sparrow. In the North, their early arrival and tumbling song are happy indications of the return of spring. Male Red-winged Blackbirds seem to do anything and everything they can to get noticed, sitting on high perches and belting out their conk-la-ree! song all day long. Females stay lower, skulking through vegetation for food and quietly weaving together their remarkable nests. In winter, this bird will gather in huge flocks to eat grains with other blackbird species and starlings. Impressive work! I don’t impress easy. One of my favorites, a sign of summer in the north. Michael, we have them here all year! They are not migratory to this region.